Research shows that one in every four shots that you make when on the course will be while using a wedge. This point holds regardless of whether you are a beginner or pro and whether you have a high or low your handicap. The frequency of using a wedge makes it one of the vital clubs on your set and so you have to ensure that you get the best. 3 Which Wedges Should You Carry? For professional golfers and the experienced ones with a low handicap, choosing a wedge is quite simple since they already know what works best for them. But, the same is not true for beginners and high handicappers. High handicappers need something to lower their score and improve their overall performance on the course as they learn the sport and work towards also lowering their handicap. Although the myriad of options in the market from various brands can make your choice difficult, with the right and sufficient information, you can be confident of finding the best wedges for high handicappers. Which Wedges Should You Carry? The types and number of wedges that you have in your bag will be a matter of personal preferences. But factors like a golfer’s playing style, the course you are playing at and also your handicap will influence your choice. Although the average golfer will have about three wedges on his set, beginners and high handicappers can have four or even five. The greater number of wedges is because high handicappers are more likely to take unconventional paths when trying to get to the green.For a high handicapper, the golden rule is always to go for the most forgiving and also easy to use wedges as they are the most effective in improving their score. If you are a high handicapper searching for wedges to carry on your set the following four are your best options. The sand wedge is a helpful club that any high handicapper can add to his club set. These wedges have a loft of 56 degrees, and although their primary purpose is to make shots from bunkers, they also come in handy around high grass. They are most useful when making shots from 50 to 75 yards from the hole. If you buy your clubs as a set, the chances are that it will also include the pitching wedge and so you might not need to buy one. It is one of the scoring clubs, and it gets its name from its usefulness in getting the ball close to the hole while also saving you many strokes. The pitching wedge comes in handy when you are between 75 and 110 yards from the pin, and it has a loft of between 45 and 48 degrees. The loft will help high handicappers get the ball airborne quickly, and you can also use this club for chipping around the green. The lob wedge always comes to the rescue of high handicappers when facing difficulties playing from bare or tight lies. Lob wedges will have a loft of between 58 and 60 degrees, and they are designed to lift the ball fast so that it can stop with minimum roll on the green. But, this wedge is what most high handicappers will use the least since it is not very consistent. If you want to have many wedge options, you can carry it since it can also work as a substitute to the gap wedge. Once you determine the wedges that you need to carry on your golf bag the next and equally important step is to know how to pick the right ones. With the many brands in the market, this can be a little challenging. But, if you consider the following factors you should not have any difficulties choosing the best wedges for high handicappers. The loft is the angle between the shaft and face of the club. Wedges tend to have the largest loft angles in a club set. The loft will also vary from one wedge type to the other. When picking your wedge the important thing to remember is that those with higher lofts launch the ball higher, are more accurate, and create less side spin. But, those with larger lofts (above 60-degrees) are also difficult for high handicappers to hit. The bounce is the part of the wedge that will hit the ground. It will come into play when you are dealing with shots from the sand or turf. A wedge with a good bounce will allow you to slide the head through the sand instead of using it as a shovel. When picking your wedges, the right idea is to choose a bounce that suits the turf conditions on the course you play on and your swing. For high handicappers, wedges with a mid bounce (7 to 10 degrees) are the best as they are the most versatile option. Mid bounce wedges are suitable for a broad range of swings and turf conditions. Grind is an important factor to consider when choosing a wedge regardless of your handicap. The Grind refers to the additional shaping of the sole around the heel or toe to make the wedge hit better. Manufacturers now offer more sole grinds than any other time, and so you will have plenty of options. The most common options are the F-grind that is suitable for all swing types and course conditions, M-grind that is very versatile around the green and S-grind that is always very stable when making full shots. Most wedges will come with a steel shaft, and so you will not need to make any difficult choices when it comes to the shaft. But, those that are part of a set can also have a graphite shaft like the other clubs. For the flex, you might need to choose between stiff or wedge flex. However, most will come in a wedge flex which is also what works best for most high-handicappers. The wedge flex will provide maximum accuracy and a great feel which are very helpful for high handicappers. Other factors like the finish which is all about the color and look are all about personal preferences. However, it is important for golfers to note that different finishes will wear differently. Price and brand reputation are also important factors to consider when shopping for wedges. If you do not already have a favorite brand, the best idea is always to buy wedges from the leading ones or those with many positive customer reviews. And when it comes to the price you should go for the best quality wedges that are within your budget. 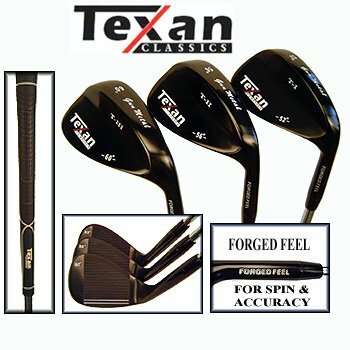 If you are on the market for a set of wedges and do not have a lot of cash to spend this set from Texan will be an excellent pick. They are a set of three different wedges at a price of one, and they come in various loft and bounce angles. These wedges feature a Forged Feel head to improve control and True Temper steel shafts that come in a regular flex. They also have a stylish and confidence-boosting gun metal finish to make them some of the best wedges for high handicappers. Design: Texan Classics makes these wedges with Forged Feel heads to provide a greater control which makes them very ideal for the high handicappers. Shaft: For the shaft, the company uses a True Temper steel to improve the performance and durability. The shafts come in a regular flex. Finish: The gun metal finish gives these clubs a modern and stylish appearance. Also, the black finish will help in alignment as it creates some contrast with the ball and turf. Hand Orientation: These wedges come in men’s right-hand orientation. Loft and Bounce: The three wedges come in three different loft angles which are 52, 56 and 60 degrees. For the bounce, you get AW-6 degrees, LW-7 degrees, and SW-8 degrees. It is a set of three wedges with progressive loft degrees. The fact that you get three clubs make these wedges very affordable. Each of the wedges has a forged feel head for greater control. The steel shafts with a regular flex make them ideal for both high handicappers and professional golfers. They come with a comfortable and all-weather grip. Texan Classics gives the club a sleek gun metal finish for a stylish look. They are only available in a men’s right-hand version. The paint on the lettering on the club head chips easily. Although the rubber grip is quite comfortable, it is still not the best, and many golfers may need to change or enhance it. Some golfers will not like the fact that they feel a few inches longer than the regular wedges. Cleveland is one of those brands that will always have a place in most wedges for high handicapper’s reviews. 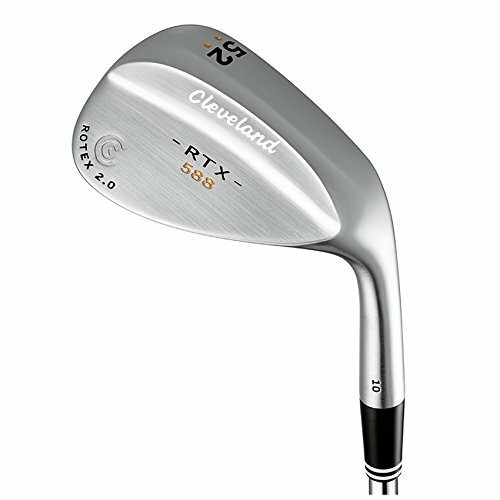 The Cleveland RTX 2.0 is one of their most popular wedges, and it appeals to both armateurs and professionals. This amazing wedge features Tour Zip Grooves, Rotex 2.0 Face Pattern, Laser Milling, 3-Grind Options and a black satin finish. Like most other wedges it has a steel shaft that comes in a regular flex, and it is available for both right and left-hand players. Tour Zip Grooves: Cleveland uses 4th generations Tour Zip grooves for this wedge. They have larger walls, and their radii are also sharper than most other wedges to improve the spin and contact. Rotex 2.0: The RTX 2.0 Face Pattern is the highlight of this wedge. Laser Milling: The laser milling helps to fine tune the micro roughness on the face to provide consistency and improve the texture. 3-Grind Options: This wedge gives you 3-grind options to help golfers maximize their performance depending on the turf conditions, skill level, and their preferences. Shaft: 588 RTX 2.0 comes with a steel shaft that is in a regular flex. Finish: The finish always matters for most golfers. 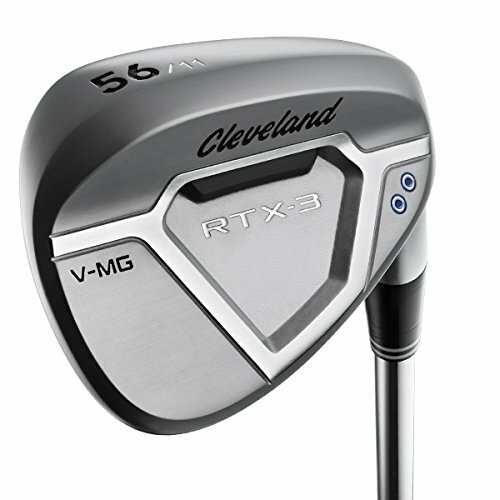 Cleveland knows this, and so they give this wedge a black satin finish for a classic overall look. You get numerous loft angles and bounce options. The grooves have larger walls and sharper radii to provide cleaner contact and improve spin. Cleveland makes the wedge with feedback from tour pros to make it more versatile. The laser milling provides more consistency and texture across the club face. You get three grind options to maximize the performance according to the turf conditions and your skill level. The black satin finish gives the wedges a classic appearance. This wedge is easy to hit, and it does not take long to get used to it. The black finish wears out fast. It has a slight glare when playing under direct and intense sunlight. The feel needs some improvement. Cleveland Golf makes the best golf wedges, and they are always improving their technologies and designs. The RTX-3 is an improvement of the RTX-2, and it builds on most of its technologies. This wedge features a New Feel Balancing technology, a new Rotex Face, V Sole Grinds, Tour Zip Grooves and Optimal Laser Milling. 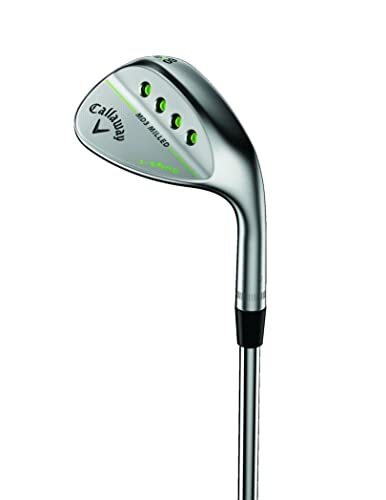 This wedge comes with a steel shaft that is available in the wedge flex. Also, you get to choose from several loft angles and bounce options and between tour satin and tour black finishes. New Feel balancing Tech: This technology entails giving the wedge a more centered center of gravity to improve the feel and tighten dispersion to give a golfer maximum control. Cleveland achieves this by taking nine grams of mass from the hosel and redistributing it to the head. Rotex Face: The 3rd generation Rotex Face on this wedge consists of three impressive innovations. They include the refined groove shape and the Rotex micro-milling face pattern. V Sole Grinds: This wedge is available in three different grinds that are tour proven. They feature a V-shape that provides consistent speeds through the turf to increase the club speed and control. Tour Zip Grooves: The Tour Zip Grooves on this wedge are an improvement of the RTX-2, and they are deeper and narrower to increase the spin. Optimal Laser Milling: The laser milling technology is a key technology in most Cleveland wedges, and it entails engraving lines between the groves to add some friction and increase the spin. It offers some exceptional spin levels. This wedge provides lower ball flight that is easier to control. The RTX-3 sole has a V-shaped design that maintains more speed through the turf. You get to choose between tour black and tour satin finishes. It has improved distance and dispersion consistency. The center of gravity is ‘more centered’ to improve the feel and offer maximum control. Laser milling adds some friction to the face and increases spin on the green side shots. The hitting area appears narrower than what you get with other wedges, and so it will not please the less confident chippers. The stunning black finish tends to fade quickly. Some golfers claim the wedge spins too much. This wedge is slightly pricier than the regular ones. There is always something about a brand that keeps many golfers loyal to it and for Callaway, it is their innovation and desire to always improve the performance of their clubs. Both are clearly evident in the Mack Daddy 3 wedge as it is designed to give high handicappers an easy time and top-notch performance. The wedge has a uniquely shaped 1025c steel clubhead for great feel and response for every shot you make, a progressive groove design for a consistent spin even as the loft increases and 3 grind options. Also, it uses a steel shaft that comes in a stiff flex and for the finish, you get to choose between two striking options. Progressive Groove: Callaway ensures that you always get a smooth spin transition when moving up the loft with the progressive groove optimization. It is a unique groove design that ensures the center of gravity also moves upward as the loft increases. The aim of this is to make attacking the pin easier by not sacrificing any significant spin as the loft increases. Grind: By making use of three different grinds which are C, W, and S-grinds, Callaway makes it possible for golfers to optimize this wedge to suit their game and the shots that they intend to hit. Shaft: Like with most other wedges for high handicappers and beginners, the shaft on this one is made from steel, and it comes with a stiff flex for maximum performance. Finish: For the finish, golfers will get to choose between two appealing options which are satin chrome and brushed slate both of which will give you a fantastic looking club. 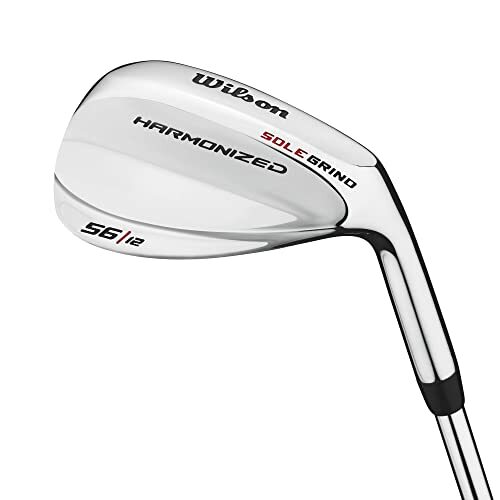 Despite the fact that most Wilson wedges including the Harmonized tend to be highly affordable when compared with many other top brands out there, they still offer great performance. The Harmonized is one of the best wedges for the money out there, and it comes with a unique sole grind that helps to improve the overall performance by allowing further opening up of the wedge’s face. Also, the true temper steel construction makes this a high-performing and reliable wedge, and the wedge shaft is perfect for high handicappers. The blade shape is also very useful in improving the spin and versatility of the wedge while the classic highly polished finish gives it an appealing overall appearance. Shaft: Wilson makes this wedge with a steel shaft which is what a high handicapper needs for top-notch performance, and it will come in the wedge flex for top-notch performance. Blade Shape: For the blade shape, Wilsons adds some modified bounce angles that help to provide dead stop spin and make this a highly versatile wedge that will perform well from the rough, sand and fairway. Finish: The classic high polish finish not only gives this wedge a striking look but can also be very useful for alignment when making shots from the sand or fairway as it makes the club stand out against these surfaces. When choosing the best wedges for high handicappers, the first thing should be to figure out what you need these clubs to do for you when on the course. Once you determine the shots you want to play with the wedge, and the distances to cover, things will be easy for you. Having many wedges on your set also gives you more options which can help you lower your score and handicap. And finally, high handicappers should also make sure that their wedges inspire confidence at address and also give them the feedback they need to improve their short game.